Civil society activism in Honduras is constrained by high levels of inequality and social exclusion, the increasing penetration of drug trafficking, organised crime and street gangs, and one of the world’s highest homicide rates. On 13th September 2018, 18 land rights defenders and members of Comité Municipal de Defensa de los Bienes Comunes y Públicos de Tocoa were informed of an arrest warrant issued against them. On 13th September 2018, 18 land rights defenders and members of Comité Municipal de Defensa de los Bienes Comunes y Públicos de Tocoa were informed of an arrest warrant issued against them. The defenders participated in the Campamento Digno por el Agua y la Vida (Dignity Camp for Water and Life) to protest against the mining company Inversión Los Pinares, which is causing serious environmental damage in the San Pedro and Guapinol rivers. In a separate incident, the Plataforma Agraria, expressed on 28th September 2018 their concern over the arrival of unknown armed men to the premises of Paso Agua cooperative in the Aguan Valley, an area currently under dispute with the private company, Dinant Corporation. In their communication, the organisation said that at least 20 armed men arrived to intimidate the community. One of its leaders was murdered in 2012 and they now fear for the lives of Hipólito Rivas, Jaime Cabrera y José Chávez, who are under protection measures granted by the Inter-American Commission on Human Rights. In other developments, at least 17 students and human rights defenders have been informed that the court decision that dismissed the charges against them for participating in a series of protests in 2017 was revoked. They are now again subject to a judicial process for participating in demonstrations last year demanding better conditions for public education. The family of Berta Cáceres reported a series of due process violations in the context of the hearing regarding Cáceres' murder in 2016 as reported by the Monitor. For example, it was reported that the court issued a decision where it declared that the victim's representatives "abandoned" the process. In addition, the prosecutor imposed restrictions to prevent the arrival of Gustavo Castro to the country. Castro is a key witness in this case as he was with Berta when the murder took place. On 13th October 2018, the "Migrant Caravan" started in the city of San Pedro Sula. Initially, approximately 2,000 Hondurans embarked on their trip to the United States looking for better living conditions. The UN estimates that there are currently more than 7,000 people involved in the mobilisation that has already crossed Guatemala and part of Mexico. The US government has been putting pressure on the Honduran government to stop the mobilisation. The government set a blockade in the border with Guatemala to try and stop the caravan but the mobilisation managed to continue its way to the United States. In a press release issued on 23rd October, the Inter-American Commission on Human Rights (IACHR) expressed its concern about the constant violation of human rights that participants of this caravan are facing and called on the authorities of the transit countries to protect the caravan participants. At the national level, priest Ismael Moreno called for an internal caravan from Santa Cruz in the north of the country to Tegucigalpa as a sign of solidarity with the "Migrant Caravan" and to reject the current administration of Juan Orlando Hernandez. On 15th September 2018, police officers repressed a peaceful demonstration in Tegucigalpa during the independence day celebrations. At least 20 people had to be assisted after fainting as a consequence of the tear gas used by police. "The eyes of the world are on Honduras as the Berta Cáceres trial begins. If the Honduran government is serious about protecting democratic values like press freedom, authorities must investigate the threats against Lakhani and ensure she and other journalists are not driven from reporting on entire regions." On 24th September 2018, the journalist Fabricio Garibaldi Mejía was called to a mediation hearing after he was sued for defamation after publishing on social media several complaints about unjustified dismissals and the misuse of funds from Cooperativa Taulabé Limitada. Given that no agreement was reached between the parties, Garibaldi now has to wait for an initial hearing and the start of the trial. State and non-state actors regularly attack, intimidate and judicially harass human rights defenders. State and non-state actors regularly attack, intimidate and judicially harass human rights defenders. Women human rights defenders are especially targeted as are advocates for land rights. The government has so far failed to prosecute most crimes or provide effective protections for those at risk. Political activism have become a dangerous activity. Prior to the elections, three political activists from opposition parties were killed. 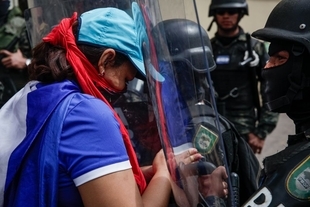 After the 2017 presidential elections, attacks and threats against human rights defenders (HRDs), especially those denouncing the repression of protests, has increased. The Special Law for Non-Governmental Development Organisations was passed in 2011 and regulates the operation and registration of CSOs. The legislation prevents the government from exercising too much discretion when registering organisations, as it had done in the past. However, registration procedures are long, cumbersome and expensive. The constitution guarantees the right to assemble as long as "public order and good custom" are not contravened. The constitution guarantees the right to assemble as long as "public order and good custom" are not contravened. Although authorities must be given 72 hours’ notice, spontaneous demonstrations are also allowed based on constitutional provisions. The Law on Police and Social Affairs permits police to disperse protests which prevent free circulation, damage property or endanger public order or morality. The Criminal Code imposes fines and imprisonment for convening unlawful demonstrations. Peaceful demonstrations ate often met with excessive force by security forces, especially students protests. For example, on September 2017, security forces dispersed a protest at Universidad Nacional Autónoma de Honduras and arrested several of the students. The freedom of expression is constitutionally protected, but the environment for journalism is inhospitable. The freedom of expression is constitutionally protected, but the environment for journalism is inhospitable. Journalists – especially those reporting on protests, organised crime, corruption or human rights abuses – suffer threats, intimidation and physical attacks by both state and non-state actors, and most crimes against them are not investigated and prosecuted. Honduras adopted an access to information law in 2006; however, the regressive Law on Official Secrets and Classification of Public Information imposes limitations and restrictions on the right to information. Defamation statutes are still applied. Community radio stations operate in precarious legality and are regularly harassed.